This clear stamp set by Mama Elephant - Arctic Penguins is so adorable! To create the sky I sponged using a mini blending tool. Ink colors: Memento Ink Pads - summer sky and zeal teal. The white snow was done by hand using my favorite white pen! It's the best and never clogs. 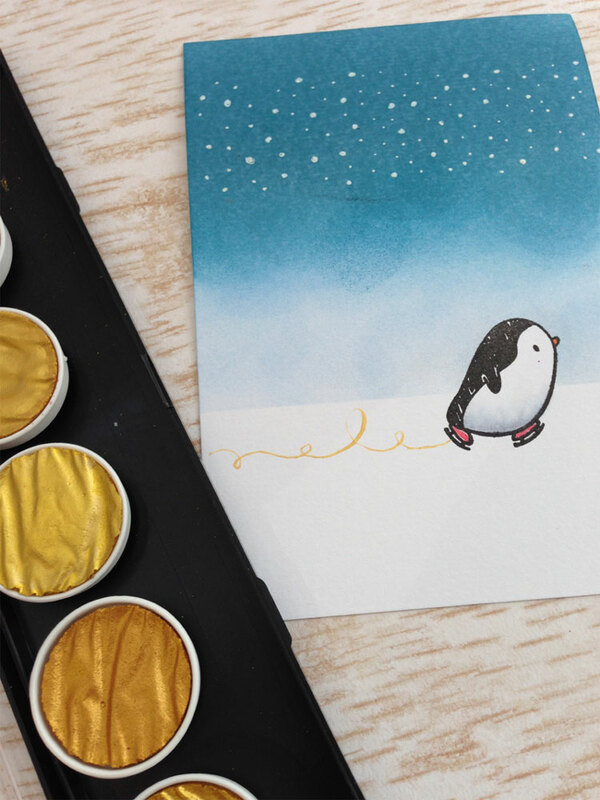 The gold paints are a new product and are amazing! They are from Germany and made with mica. You can use it to watercolor, paint or even use with your pointed calligraphy pen! This entry was posted in Just Arrived on October 28, 2014 by Impress. 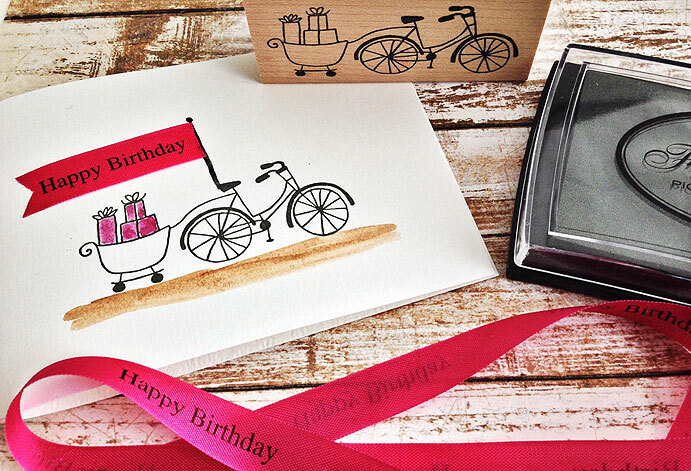 Add a fun flowing ribbon banner to the birthday bike stamp with this happy birthday rayon tiding ribbon. Stamp the bike and then use a black pen to draw a banner pole. Notch the ribbon end and glue a small piece to the pole. Ground the bike with a watercolor wash using your favorite watercolor set. We love our Koi set. The quality of this paint set is amazing. The set also comes with a waterbrush which we love to use too so it's a great bargain. This entry was posted in Just Arrived, Trend Alerts on June 4, 2014 by ann. A personalized gift . . .
Want us to help you with your holiday shopping? Here's a fun gift that would fit almost everyone on your holiday list. 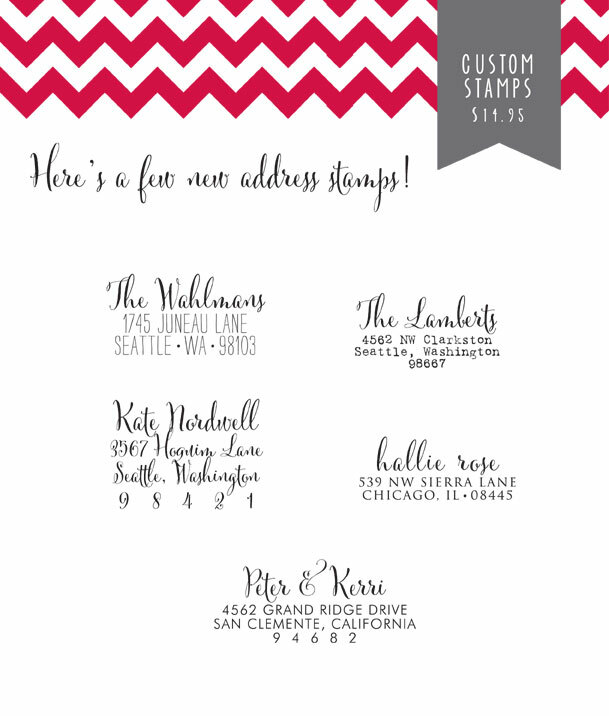 Pick the style of stamp you like and then after ordering, just email us with the details and we'll create a "designer" custom stamp for you. These new designs are only $14.95. Order now before the crazy holiday season is upon us. Then you can sit back with your feet up and enjoy the holiday season knowing you're done with shopping and ready for the festivities to begin! This entry was posted in Just Arrived on November 22, 2013 by ann. 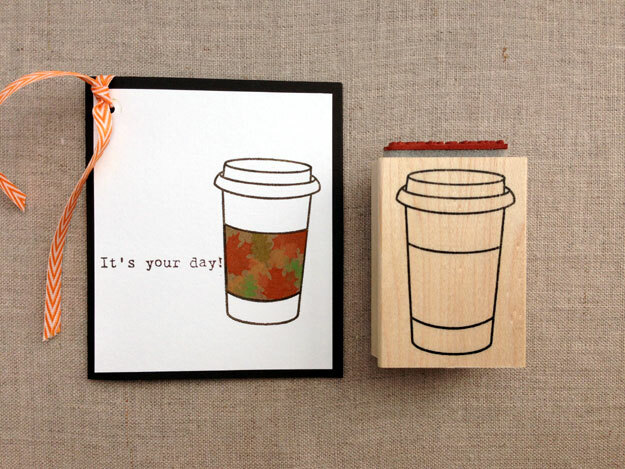 Maybe it's your day! Have signed up to be our friend on facebook? We're doing a giveaway today. One person will win $50. to shop on our new site! All you have to do is check out the site and then make a comment about what you'd like to buy. Good luck! This entry was posted in Just Arrived on October 9, 2013 by cmsbackend. It's a beautiful day at Impress. Our new website is up and we're so happy to share it with you. We've been working really hard getting everything ready to launch impresscardsandcrafts.com - it's kind of like building a house - there are so many details that it's sometimes overwhelming but today's the day! I'm sure you've noticed we changed our name - we've been in business for 26 years and started out pretty much just selling rubber stamps but now we're a whole lot more - paper, dies, paints, ribbons, party supplies, tools, books - anything creative we can find. 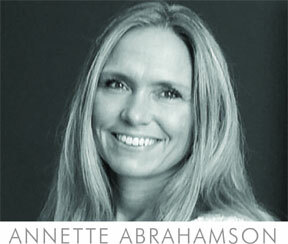 We love the creative process and how sharing creative ideas is so rewarding. Thanks to all of you for being great Impress customers. We hope you like our new site! This entry was posted in Just Arrived, Trend Alerts on October 8, 2013 by cmsbackend. Have a wonderful day . . .. It's fun when you make a card and everyone asks in amazement, "how did you do that?". The recipient acts like you did something wonderful when it was really easy. 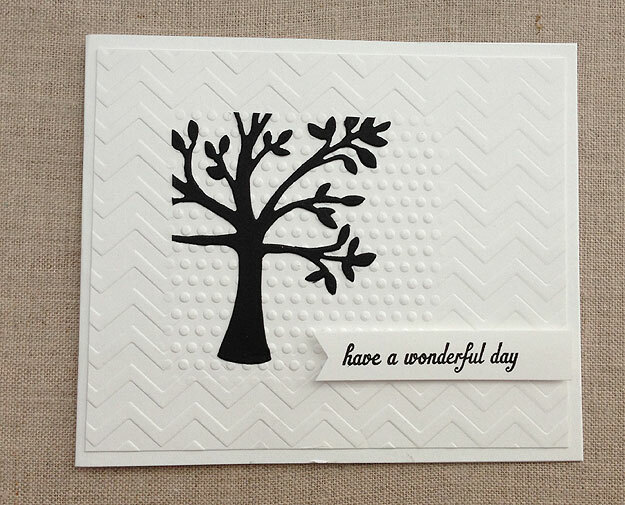 Tim Holtz Diffusers allow you to block off part of a card where you don't want it to emboss. For our card we ran the paper through our Big Shot twice, once with the small inset square diffuser and the spotted embossing plate and then again with the square frame diffuser and the zig zag embossing folder. The tree is Savvy's leafy tree die. This entry was posted in Just Arrived on September 29, 2013 by cmsbackend.